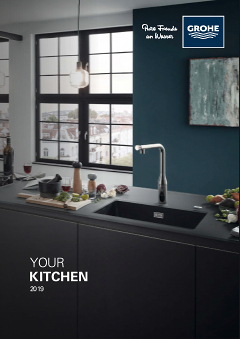 This GROHE Eurosmart kitchen tap's swivel spout makes it a handy foil to all your kitchen tasks. This wall-mounted sink mixer has many tempting features, including the GROHE SilkMove cartridge that lets you vary water temperature and flow effortlessly. The ergonomically designed lever feels intuitive and offers starightforward handling. You also get a built-in temperature limiter that provides safety from scalding. Our easy installation system means mounting your tap is quick and trouble-free. Presented in GROHE StarLight chrome, this tap is effortless to maintain and will lend a hard-wearing lustre to your kitchen.